Since it’s founding in 1915, The Print Center has fulfilled a unique and important role in creating opportunities for artists, investigating new processes and supporting the print image in all its forms. In order to honor our accomplishments and launch a sensational second century, The Print Center is hosting an exquisite and lively evening of fine food, drink and entertainment. In support of the Centennial Fund, the Gala & Street Party will celebrate the legacy of one of Philadelphia’s bedrock institutions, recently described as a “national treasure.” Proceeds will help us increase investment into exhibition planning, launch a publications program, expand educational offerings and prepare our home for the next one hundred years! The Centennial Gala will feature artists Henry Horenstein, Dennis McNett, William Earle Williams and Andrew Jeffrey Wright. Space is limited, please reserve your tickets by 31 October 2015. The Print Center Street Party was a mainstay of the Philadelphia art and social scene for many years and is fondly remembered. Join us for cocktails, food, dancing and interactive art from Dennis McNett as we revive this fabulous tradition with a party not to be missed! 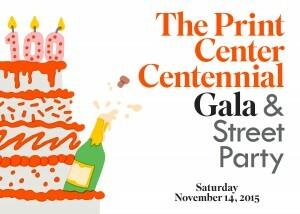 The Print Center’s Centennial Gala & Street Party will be a momentous, joyous occasion and one not to be missed! To purchase your tickets click here.